Obsolescence. Its avoidance is the biggest problem facing any gadget nerd. This affliction, this curse that disables so many would-be tablet and smartphone buyers, only intensifies for those of us who somehow manage to procreate. See, newbie reproducers, temporarily insane from an overblown sense of paternal concern, will pay just about anything for products promising to make their new baby healthier or happier, regardless of the product's potential lifespan. Come on, parents, admit it. Just look at that $100 bottle sterilizer you've already replaced with a more convenient pot of boiled tap water. Or how about that $380 hands-free breast pump that went idle after 6 months of occasional use or that $1,000 euro-exotic stroller that turned out to be too bulky to regularly transport by car? Your well-meaning, but irrational ways made you an easy target for the baby-care industry that places your ilk on the sucker-side of the consumer savviness scale. Just look at the extortionary prices of the typical babycam. You can easily spend between $200 and $300 for a so-called "top-of-the line" monitor that's plagued by radio interference, poor range, and shabby video quality. To make matters worse, these single-purpose cameras lose their usefulness once baby is grown. So what's a rational, resourceful parent to do? Easy, use an IP-based surveillance camera as a baby monitor instead. Not only do you get a superior wireless camera for about the same price (or less), you have the option of repurposing it for inclusion in your home automation or security system after baby is grown. That's what we've been doing for several weeks now thanks to WiFi Baby. And you know what? We'll never go back to traditional baby monitors again. Click through to find out why. While you've most likely never heard of WiFi Baby -- a small, family-run company in Florida -- you might already be familiar with the Y-cam range of networked surveillance cameras. The WiFi Baby 3G (as in third-generation, not wireless data) is built upon the Y-cam Knight S YCK004 camera with a 1/4-inch, 3 megapixel CMOS imager capable of recording audio and 640 x 480 pixel video at 30fps in just 1 Lux of light. A ring of 30 infrared LEDs provides nighttime visibility at a range of about 15 meters (almost 50 feet). The camera works over tethered Ethernet or 802.11b/g WiFi with options for WEP, WPA, and WPA2 encryption and support for RTSP/RTP/RTCP, 3GPP, ASF streams. It also supports UPNP network discovery as well as the ability to send visuals to your home NAS, FTP server, or email account at preset timings or whenever a motion-sensing alarm is triggered (more on that later). 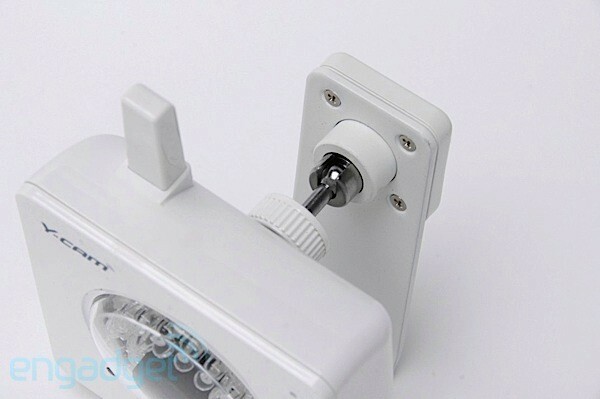 The cam can be mounted on the wall, ceiling, or crib as long as you have access to power. Otherwise, there's an attachable stand for placing the WiFi Baby 3G on a flat tabletop. The camera can easily be swiveled in the direction of your heaving genetic spawn thanks to a highly adjustable ball-and-socket design. Parents will appreciate these placement options as they try to position the camera around visual barriers like guard rails, crib skirts, and the Mozartian quartette you hired to stimulate baby's spatial-temporal reasoning. And yes, it is fun telling friends that you put WiFi Baby in the corner. Unlike traditional babycams, the WiFi Baby 3G does not include a dedicated monitor for viewing and listening to your tot. Instead, you access the camera's video and audio from a web browser, Y-cam MultiLive for Windows PCs and Macs, or through a variety of third-party apps for iOS, BlackBerry, and Android handsets. We used an iPhone 4 to test the WiFi Baby-recommended Baby Monitor HD (read: VGA), a $9.99 iOS app. We also tried the free Y-cam MultiLive apps on both iOS and Android. Sadly, a bug in the Y-cam MultiLive app inhibits audio from streaming on the latest iOS 4.3.x builds while the Android flavor was, well, just plain buggy, requiring constant force-quits. Fortunately, there are several other apps listed in both the Apple App Store and Android Market that claim Y-cam compatibility. All told, we quickly settled on Baby Monitor HD as our preferred app, irrespective of its somewhat confusing operation (pinch outwardly to view in landscape?) and muddled settings page. And if you're the proud parent of an in-vitro fertilized jackpot then you'll be happy to know that the Baby Monitor HD app supports up to four simultaneous live video feeds. The MultiLive for Mac application is dead simple to set up thanks to the auto-discovery feature. It supports up to nine separate feeds and streams audio and video at a smooth 30 frames per second. You can view the action full screen, snap photos, and even record a video clip (first steps?) on a whim or whenever your preset motion alarms are tripped. Plenty of options here. Now, because the WiFi Baby 3G camera is IP-based, it can be accessed from well beyond the operating radius of the typical 900MHz baby monitor. In fact, we regularly used the Baby Monitor HD iOS app and laptop browser to check in from around the world, over both 3G and WiFi connections. Our UPNP-enabled router was able to locate and automatically forward the appropriate ports necessary to view the password-protected WiFi Baby 3G camera from outside the home. It's a powerful thing, seeing your spouse reading bedtime stories to your child as you prepare for the workday from the other side of the globe. While seeing your baby is nice, hearing your young'un is arguably more important as a means of alerting you to trouble. Fortunately, the WiFi Baby is perfectly capable of alerting uneasy parents to noises from the baby room. The audio, captured by the WiFi Baby's electret condenser microphone, plays out the speaker of your chosen monitoring device(s). The Baby Monitor HD app includes a number of enhancements to mute the background noise with low, medium, and high squelch settings. That way, only your baby's cries are transmitted and not the construction clamor from beyond the window. A tap of the app's audio window (presented as a graph in portrait mode) lets you temporarily override the mute whenever you want to listen in. An additional setting lets you configure optional "cuckoo," "crow," or "ding" alerts (plus vibration) whenever the sound approaches the 80 percent threshold. These settings worked well as long the app was running in the foreground and the device's volume was sufficiently loud enough to be heard. Unfortunately, you won't receive audio alerts when the iOS device is on standby or when the volume is muted. Ideally, future versions of the app would operate in the background with an option to override the handset's current volume setting to blast alerts at anxious parents. Overall, we're pretty happy using the WiFi Baby 3G as a baby video monitor. In fact, in our experience, only Luvion's brand of premium video baby monitors can hold a candela to the Y-cam in terms of convenience and interference-free image quality under a variety of lighting conditions. 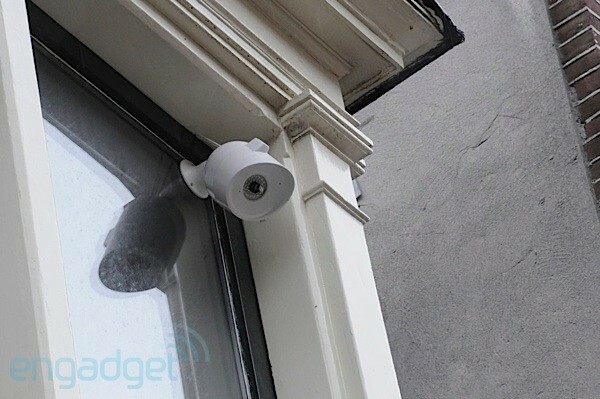 However, unlike Luvion's cameras, your Y-cam can be converted to an all-weather outdoor surveillance camera for home security / monitoring with a $99 "Shell" adapter and 10 minutes of assembly. True, stuffing the relatively diminutive WiFi Baby 3G into a shiny hunk of 17 x 13.5 x 12.5cm plastic tubing makes quite the statement when slung off the upper floor of our European HQ -- but its conspicuous appearance translates into additional security. Already, just the presence of the camera seems to have stopped at least one neighborhood punk from tampering with our property. For additional stealth, you can turn the external power indicator on or off using software, but the eerie red halo produced by the cam's 30 IR LEDs at night is inescapable. Of course, you can also disable the night vision feature completely or set it to function automatically using the camera's ambient light sensor. While there's a "moonlight mode" that superimposes frames to brighten an otherwise dimly lit image, it's no match for the cam's infrared capability -- if you want to see in the dark, you have to use the cam's night vision mode. Keep in mind that the IR range will likely decrease when pointing the WiFi Baby 3G camera outside due to the lack of walls needed to bounce the IR light back onto the objects you wish to illuminate. 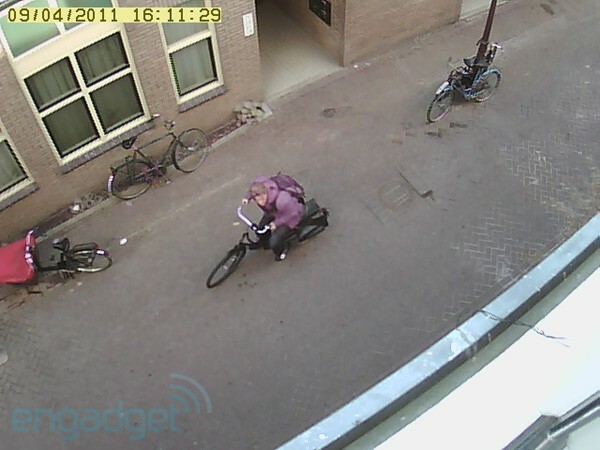 Nevertheless, we're still able to see the street (and our bicycle) fairly clearly from a camera mounted on the third-floor window. In practice, we'd likely augment the camera's ability with a separate IR illuminator or flood (and wipe away the spider web). Naturally, all the features that make the WiFi Baby 3G a great baby camera also make it a great surveillance cam. But some features are paricularly well-suited to security. 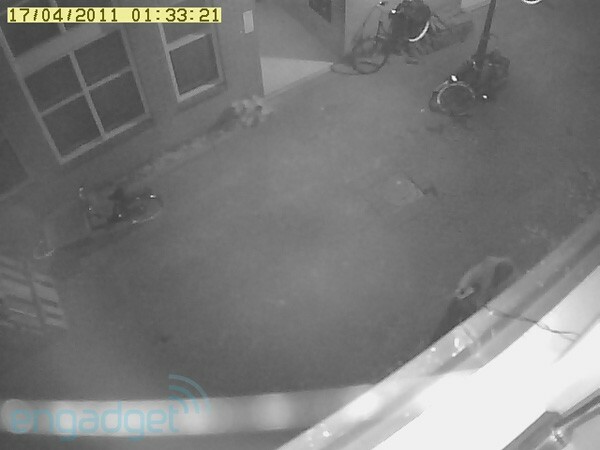 For example, you can set up several positional motion alarms of varying sensitivity to send a snapshot and / or video with sound to your FTP server, NAS, or email address whenever the camera detects movement. 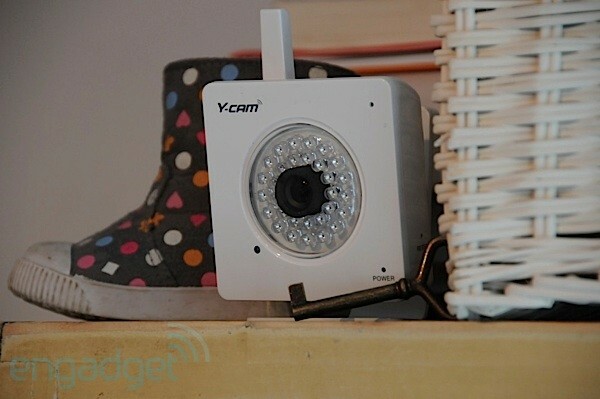 Y-cam also offers a Y-cam Knight SD camera model that records directly to removable SD cards. Storing your surveillance footage is useful for reviewing it after an incident occurred. For our testing, we configured the camera to record a 30 second video clip and still image to our NAS server at 30 minute intervals and whenever motion is detected. Of course, like all consumer grade surveillance cameras, the motion detection feature can flounder in the face of flying insects or wind-blown vegetation -- an issue not seen by city dwellers like us. Of course, we do have some complaints. For one thing, the image colors have inexplicably shifted into the violet range of the visible spectrum. This wasn't always the case and could be related to a configuration setting we tweaked along the way -- there are many. While the color offset is fine for viewing baby's play habits, it's not very useful when trying to identify the colors of a perpetrator's clothing to police. Also, we'd recommend repurposing an old Android or iPhone handset to use as a dedicated monitoring device with access to power (preferably in a cradle) near the bed. That way, you always have a master monitoring device at the ready to alert parents to cries of distress. Also, because the camera depends upon your WiFi network, it's not the kind of baby monitor that you'll toss in an overnight bag ready for use at grandma's house. Our biggest gripe, however, is the premium placed on what amounts to a generic Y-cam Knight S surveillance camera. WiFi Baby lists the third-generation camera for $279 -- a price that includes US shipping and all applicable taxes. 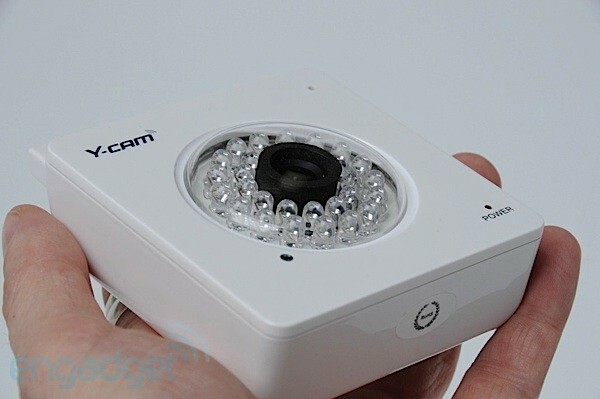 The identical Y-cam Knight S version YCK004 can be had for $50 less from Amazon and other US sites. WiFi Baby claims that its phone and email support justifies the differential. Perhaps. We didn't have any need for it thanks to Y-cam's own user manual and a number of helpful tutorials freely available on WiFi Baby's site. To make matter worse, owners will still have to dish out an additional $19.95 to a WiFi Baby network specialists if they get stuck trying to poke holes through their router for viewing the camera over the internet -- that feature isn't freely supported under WiFi Baby's terms and conditions. The company does plan to deliver additional value in the future. It's already working on an Android app for release in 2011 as well as custom firmware, co-developed with Y-cam, that will simplify setup and provide exclusive baby monitoring features to WiFi Baby owners. So, you'll have to make the decision: spend a bit more now for a support lifeline you may or may not use with a promise for future exclusives, or put the $50 towards the $9.99 Baby Monitor HD iOS app with the remainder set aside for the $100 Y-cam Shell outdoor mount. Update: Since posting our review, WiFi Baby has eliminated the $19.95 fee for advanced technical support and is now reselling the Y-Cam Shell all-weather enclosure for $65, $35 below MSRP. It's not pink, it doesn't pack a remote temperature sensor, and it won't play an 8-bit lullaby. Hell, it's not even swaddled in an adorable "Summer Infant" or "AngelCare" moniker. Yet this third-generation WiFi Baby -- a repackaged Y-cam Knight S surveillance camera -- manages to make traditional baby video monitors look like overpriced toys. Sure, it's priced about the same as a typical high-end baby monitor, but the WiFi Baby 3G provides more features and flexibility than any traditional babycam. As the name suggests, you get WiFi freedom in addition to tethered Ethernet. You also get VGA video with sound, an IR illuminated night-vision mode, audible alerts with vibration, and plenty of iOS, Android, BlackBerry, and Mac and PC apps that let you view your baby from anywhere in the connected world. And just think, when baby's grown you can repurpose the camera for security or home monitoring tasks thanks to an optional $99 waterproof Y-cam Shell and an out-of-the-box ability to send images, video, and sound to your networked hard disk drive or personal email address whenever motion is detected. 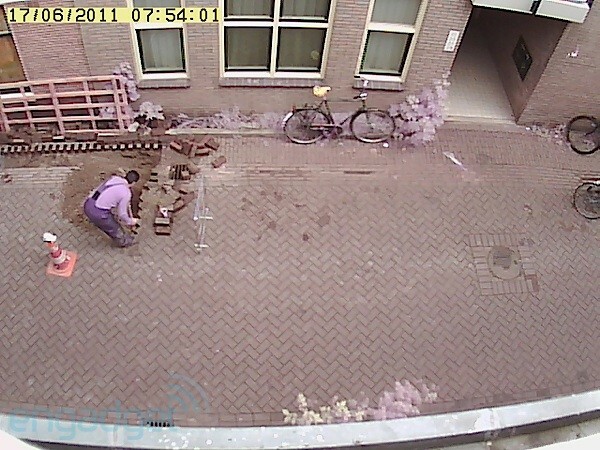 Let's see your Safety 1st or Graco babycam do that. We know that having a baby can cause well-meaning parents to do foolish things. Just don't add your choice of baby video monitors to that lengthy list. We urge you to give the WiFi Baby 3G (or its cheaper Y-cam Knight S clone) a look -- you'll have plenty of chances to disappoint your child later.